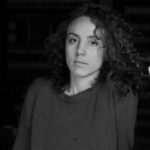 Hadar Ahuvia is a Brooklyn based performer, choreographer and educator making dances grounded in physical research and political consciousness. Her work has been presented at New York Live Arts, EMPAC, Dixon Place, CPR, Brooklyn Studios for Dance, Danspace Project’s Draftwork, Aunts, Catch, Roulette, The Whole Shabang, and Eastport Art Center, Maine. She has performed for Sara Rudner, Jill Sigman, Donna Uchizono, Kathy Westwater, Molly Poerstel, Anna Sperber, Jon Kinzel, Stuart Shugg, and Tatyana Tenenbaum. A progressive Jewish educator, she was raised in Israel and the Unites States, trained at the San Francisco Conservatory of Dance, and earned a BA from Sarah Lawrence College. She was a 2012 Dance Theater Workshop / NYLA Fresh Tracks Performance and Residency Program artist and is 2015 Movement Research Artist In Residence. Early Israeli folk dance choreographers made their work out of spiritual and ideological necessity to rethink the Jewish body and nation. In Joy Vey, I reconfigure their footsteps to reveal the conflicts and appropriations that underlie Israeli cultural formation. I am Israeli-American, the granddaughter of Ashkenazi Jewish pioneers whose stories form the backbone of Israel’s national narrative. I have come to see Zionism from the standpoint of its victims. At the same time, I recall Zionism’s liberatory potential. I call the body of research Joy Vey as a reminder to engage both realities. Tradition is grounding, but it’s wrestling with tradition that grounds me and my work. My performance projects include decontextualized liturgy and rewritten folk songs based on Biblical texts. I look forward to continuing my study of Jewish texts with artists and equal measure love and irreverence. Palestinian and Mizrahi culture were salient influences in the creation of the Israeli symbols, foods, music and a folk dance tradition begun in the 1930s. The processes of imitation, appropriation and erasure of the Other in the creation of the Israeli-self are ongoing and continue also here in the Unites States. By identifying these choreographic moves I intend to take a necessary step toward a just reconciliation.